Just Jingle: Oh, By Gosh, By Golly! 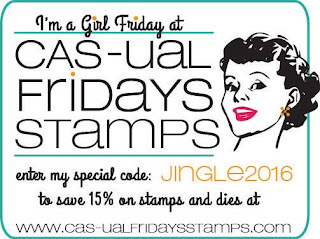 It's time for another CAS-ual Fridays Stamp July Release Reveal! Today's sets are totally fun and I know many of you are going to just LOVE them! Mistletoe & Holly and Holly Jolly Borders are both super fun stamp sets that will be staples in your holiday collection! Actually... the borders will probably just be staples, period! SO FUN! I stamped a subtle grey background and then kept my design simple, but fun by using some great colors! I love these sentiments so much!!!! Head on over to the CAS-ual Fridays Stamps blog to check out what the rest of the crew has created! They did some AWESOME stuff! For REALS!!! Oh wow! Such a lovely card! What an adorable card and I love the subtle background. It really does set off the focal image. Oh my gosh, this card is fantastic. The simplicity is very striking. Very pretty CAS card. Love the subtle grey BG. Love how you combined the two sentiments! Delightful result on this fun card!